Toby Clark, Mintel’s Director of Research, will talk about the implications of the EU vote for consumer confidence and household finances, and what this means for a range of consumer-facing markets. He’ll draw on broader economic data, Mintel’s exclusive research on consumer sentiment, and Mintel’s experience of how consumers react to changing economic conditions. How did you become a librarian/what was your career path? After graduating with a degree in English from the University of Stirling, I wrote to every University in the UK (there were fewer in 1979) asking for a job. I accepted an offer of a trainee post from Edinburgh and I was on my way. I subsequently worked for Edinburgh City Libraries, West Surrey College of Art & Design, Leicester Polytechnic, and Napier College, Polytechnic and University before joining the National Library. Did you need any specialist training for your current role? I read for a Master’s degree in Librarianship and Information Science at the University of Sheffield, and later, whilst working, I gained an MBA from Edinburgh University. What makes your library/department unique? It’s the only National Library in Scotland! And of course, the breadth and depth of our collections, and our Legal Deposit privilege. Working with so many smart and interesting people. What has been your most complex/funny/unusual enquiry? I was once asked for my trousers! Many thanks to Graeme for becoming our first ‘mini-quiz’ respondent. If you’d like to take part, or have anything else you’d like posted on this site, please contact me – The Webmaster! 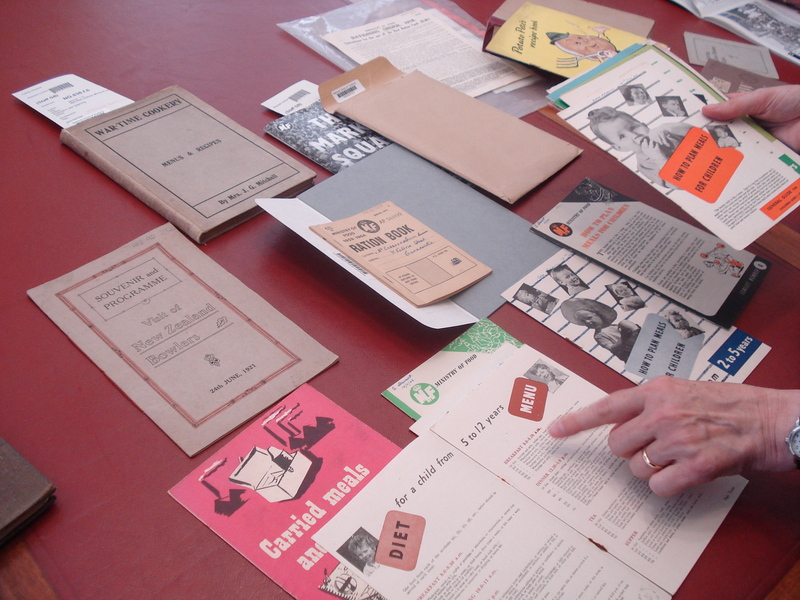 The National Library of Scotland collects and preserves all Scottish school exams papers. The collection starts with the Leavers Certificate in 1899 and continues right up to the new qualifications that young people are sitting around the country this month. Close examination and comparisons of these papers would allow us to determine if in fact exams are getting easier ? Do they equip young people for their lives ahead? My colleague and I had the pleasure of welcoming a group from Stirling to the National Library of Scotland yesterday. The visitors were from a community group and were interested the history of Stirling and also food related materials published during the world wars. They enjoyed visiting our exhibition on the history of food and drink in Scotland and also the tour of the library; seeing behind the scenes. We rounded off their visit by looking at the material that we had selected for them from our vast collections. One of the items turned out to be particularly relevant to one lady. From Castle Rock to Torbrex: essays on the High Schools of Stirling by Jessie M Thomson and Charles Strachan. The book is a history of the High School as it moved from the old building in Spittal Street to a new one in Torbrex. Jessie Thomson had been this lady’s English teacher although apparently she had a passion for Scottish history and needed little encouragement to teach them a great deal about Scottish history as well as English. There is something for everyone at the National Library of Scotland. Visit us on line or in person. Take this opportunity to learn more about your National Library, the collections, services, exhibitions and events, and see behind the scenes. Booking essential as places are limited. If you have specific access requirements or other additional needs please let our staff know when you book your place. – Book online or phone 0131 623 3734.